Develop your leadership skills and elevate your programme management game. Join our expert SeminarsWorld in Berlin to network and learn with your peers in small-group, topic-intensive seminars aligned with the PMI Talent Triangle®, while you earn up to 14 PDUs and 1.4 Continuing Education Units (CEUs). 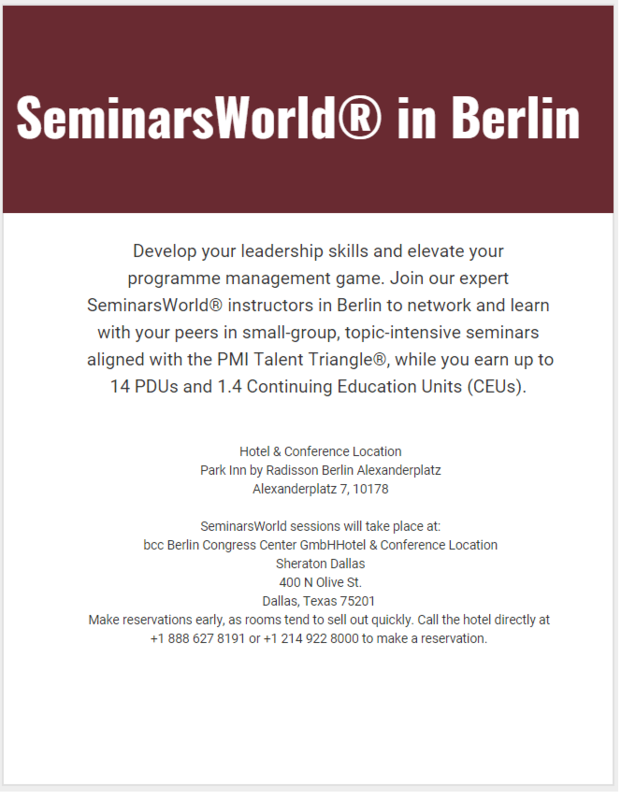 SeminarsWorld® courses complement the EMEA Congress activities also taking place in Berlin. A combination registration of both SeminarsWorld and EMEA Congress is offered at a lower rate than if you were to register separately. Register by 14 February for early bird rates. Hotel rooms at the Park Inn by Radisson are within walking distance to the bcc Berlin Congress Center. Room rates at the Park Inn are exclusive of 19% tax added at booking. Includes breakfast and WiFi. Rooms may be booked under the PMI rate until the room block is sold out. Make reservations early, as rooms tend to sell out quickly. Please contact the hotel reservations department by telephone: +49 (0)30 / 2389 4333, fax: +49 (0)30 /2389 4546 or e-mail: [email protected] in order to reserve your room.